May the blessings of truth, liberty and freedom be expounded within the Hawaiian Islands. 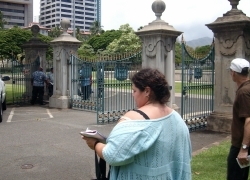 Please be advised in pursuant to the events of August 17, 2008, in my intent to lawfully reclaim the Iolani Palace, I, Royal Majesty King Akahi Nui have and hold lawful Royal Deeds to the Palace, it's grounds and all the land of the Hawai'i Islands and the same time, you or your office/ STATE OF HAWAII has never refuted or have you or the STATE OF HAWAII has proved any lawful Allodial title or otherwise held by the STATE. I, Royal Majesty Akahi Nui accept for value and honor the silence of the STATE OF HAWAII and its dishonor (failure) to produce a higher Title to the Land. Please be advised that the STATE OF HAWAII CORPORATION has no authority over Allodial land. 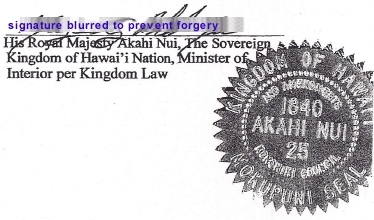 Also be advised that I, Royal Majesty King Akahi Nui have filed a superior security interest and lien on all of the land of the Hawaiian Islands due to the unlawful military invasion - 1893. In respect to my lawful right to re-claim the Palace, yesterday, August 15, 2008, on or about 4:00 PM whereupon we were met with swat team/police and 7 (seven) of my peaple were arrested and as of today, August 16, 2008, as up to 6:00 PM, remain unlawfully arrested, kidnapped and unlawfully incarcerated. Unlawfully arrested are; 1) Her Highness Akahi Wahine, 2) Vanessa Fimbres - Kings Legal Counsel, 3) Nakoa Kaahanui, 4) Lokelani Nunes, 6) Wayne Nunes and 7) Donald Alfred Love - Boltz, federal Provost Marshall. As you are aware, Donald Alfred Love - Boltz, federal Provost Marshall placed the Majesties and the Palace under federal protective custody and in light of the facts of this situation, arrested the STATE OF HAWAII, a mere corporation. As such, the STATE OF HAWAII, HONOLULU CITY POLICE and any other agencies/departments or otherwise had no authority to act against the Sovereign Kingdom of Hawaii, a federal Provost Marshall and well as those that are found within the Sovereign Kingdom of Hawaii, in support of and who were arrested. Please be advised that in respect to any charge of trespass, since I have and hold the Royal Deeds and Title to all the land and the Palace in question, therefore the charge of trrespass is a nullity, a misapplication of statute and a fraud. In respect to the damages for just unlawful incarceration is set at $571,000,000.00 for as applied towards the seven people (Trezivant vs. City of Tampa). Your trespass on my property is set at $100 Million Dollars. Claim of damages in respect ot the arrest of Donald Alfred Love - Boltz, federal Provost Marshall is set a $50 Million. Other damages for Trespass and Acts of Terrorism will be addressed and assessed in due course in time. I will consider the State police/swat team attack as an Act of Terrorism and will address the monetary claim/damages at later date. 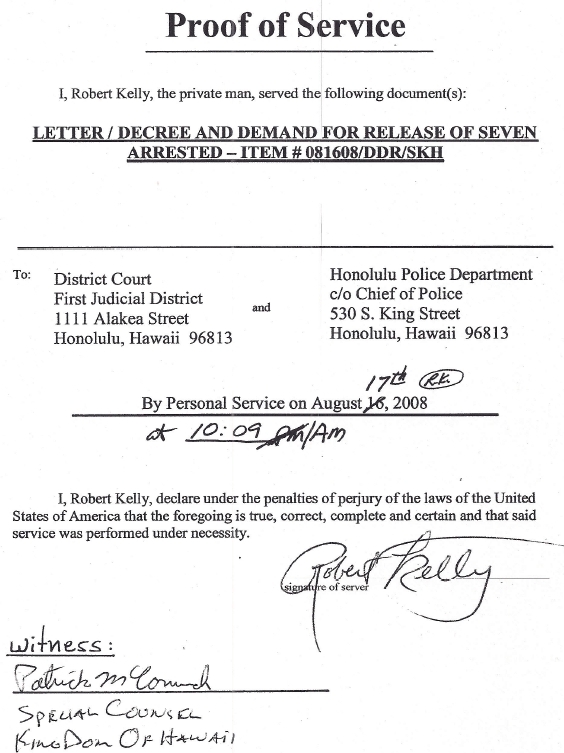 However, in respect to the current matter and the above points, I Royal Majesty King Akahi Nui had DECLARED AND DEMANDED the release of my people per similar letter served upon the Honolulu Police Department on 8-17-08 @ 10:09AM, duly witnessed. Please be advised that I also presume your actions in this matter a violation of Internationl law.